MIAMI-DADE COUNTY, Florida -- A Miami man has caught and killed the longest Burmese python ever captured in the wild in Florida. The snake measured 18 feet, 8 inches which was more than a foot longer than the previous record of 17 feet, 7 inches. The python was a 128-pound female that was not carrying eggs, according to University of Florida scientists who examined the snake. On May 11, Jason Leon was riding late at night in a rural area of southeast Miami-Dade County when he and his passenger spotted the python. About 3 feet of the snake was sticking out of the roadside brush. Leon stopped his car, grabbed the snake behind its head and started dragging it out of the brush. When the snake began to wrap itself around his leg, he called for assistance from others and then used a knife to kill the snake. Leon once owned Burmese pythons as pets and has experience handling this nonvenomous constrictor species. Leon reported his python capture to the FWC’s South Region office, which connected him with 888-IveGot1 (888-483-4861), the FWC’s hotline for reporting exotic species. 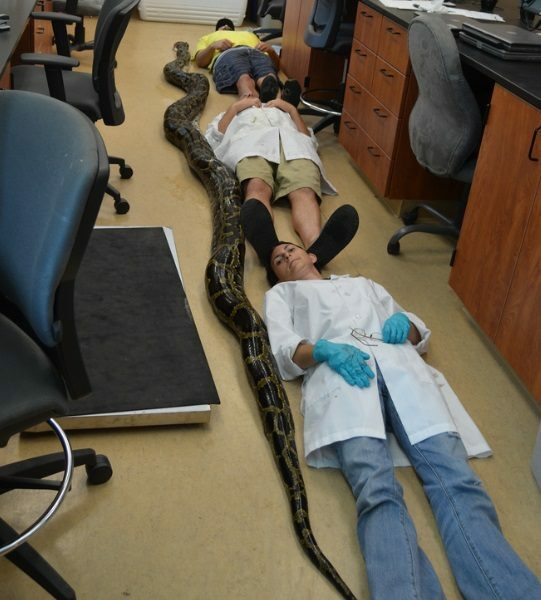 The python was later turned over to the University of Florida’s Fort Lauderdale Research and Education Center, where UF staff experienced in working with Burmese pythons performed the necropsy.